Kidney cancer refers to most types of renal cancer that occur in the kidneys (accounting for more than 85 percent). 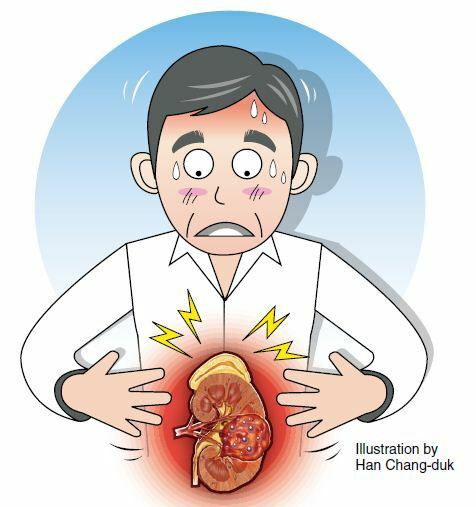 Kidney cancer accounts for approximately 1.6 percent of all cancers that occur in Korea, according to data from 2002. It is twice as likely to occur in men as in women, and is most common in the 40-60 age group. Kidney cancer is being diagnosed earlier due to heath checks and widespread use of ultrasound. The kidneys are retroperitoneal organs, so kidney cancer can be asymptomatic even after it has progressed significantly. The main symptoms of kidney cancer are pain in the side, blood in the urine (hematuria) or a palpable mass in the abdomen. Only 10-15 percent of kidney cancer patients have all three of these symptoms, which are found in advanced stages of the disease. Other atypical symptoms include fatigue, decreased appetite, weight loss and anemia. Kidney cancer does not respond well to radiotherapy or chemotherapy, which means that early diagnosis is very important. The most efficient method of diagnosis is radiological imaging such as ultrasound during health checks for early diagnosis. Patients with other environmental or genetic risk factors (cystic kidney disease, prolonged hemodialysis, Von-Hippel-Lindau syndrome, etc.) should be screened regularly. Ultrasound is an efficient test that is pain-free and noninvasive. It can provide a glimpse of various organs of the abdomen, and can determine whether masses in the kidneys are simple cysts, complex cysts or tumors. If you are thought to have solid masses (tumors) or complex cysts, you may undergo further imaging tests to determine whether they are malignant or benign. CT imaging is more accurate than ultrasounds when diagnosing masses in the kidney. It can also provide images of the blood vessels around the kidney, the surrounding tissue, renal veins, inferior vena cava, adrenal glands and local lymph node invasion to help us determine the stage of kidney cancer and the presence of metastases. Therefore, it is an important tool for planning the treatment. MRIs do not have major advantages over CTs for the diagnosis of kidney cancer, but are useful when it is difficult to determine whether masses are benign or malignant. It is also useful to evaluate the extent of tumor embolus when the kidney cancer invades the inferior vena cava. Other tests include simple chest X-rays, chest CTs and bone scans in areas where kidney cancers commonly spread. The treatment of kidney cancer is determined by the stage of the tumor, the age of the patient, systemic status and other comorbidities. The best treatment method currently available is surgical removal of the tumor. If there are metastases, immunotherapy or targeted therapy may be used, as kidney cancer does not respond well to chemoradiotherapy. Surgery ― Radical nephrectomy is the standard treatment, but in smaller tumors (smaller than 4 cm), local resection can be considered. This is because it can preserve the kidney functions while having a similar outcome in terms of metastases or recurrence. More recently, less invasive surgical methods such as laparoscopic surgery or robotic surgery have come into use. Compared to open surgery, these methods result in less pain and faster resumption of daily activities, while having similar surgical outcomes. Noninvasive treatment If patients cannot undergo surgery for some reason, radiofrequency ablation, high intensity focused ultrasound and cryotherapy can be used restrictively. This is a treatment for metastatic kidney disease, which can prevent the cancer from progressing further for a prolonged time in some patients, while there are reports of loss of metastatic lesions in a small number of patients. This is because kidney cancer is affected by the immune functions of the body. However, the treatment mechanism of action is still unclear, and there are many side effects. Therefore, it is not widely used now that targeted therapy has been developed. Targeted therapy is a treatment that targets specific parts or functions that are associated with the growth and progression of cancer, such as neovascularization (new blood vessel formation) and cell proliferation. Although kidney cancer does not respond well to chemotherapy, it does respond to targeted therapy. Targeted therapy can prevent the progression of metastatic kidney cancer to prolong the life expectancy of patients. Various targeted therapy agents are being used across the world and are still under development. Many targeted therapy agents are now covered by the national health insurance. Targeted therapy is a specific treatment with low toxicity and can improve patients’ quality of life. Compared to immunotherapy, it can extend the cancer-free survival rate and overall survival rate of patients and is now recognized as the frontline treatment for metastatic kidney disease. 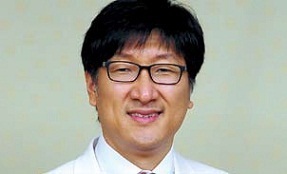 The author is a doctor in the department of urology at Samsung Medical Center and a professor at Sungkyunkwan University’s School of Medicine. ― Ed.